Today I'm happy. I got 11 hours of sleep last night, after two nights of drastically insufficient sleep (due to a new contract I've taken on at work). I got my walk in this morning, which I haven't been able to do for days (work again). It's snowing--well, on and off. And the best reason? Today is the day that Gertie got to come home! Look at that cat, can't you just feel the happiness vibes coming off her? 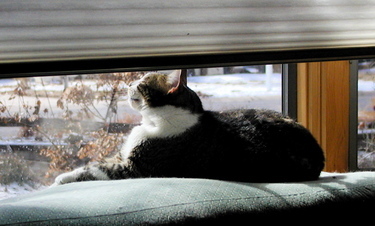 She gets to sit in the sun again. At home. Life is good. Except for Zhinka. Who might as well never have met Gert before in her life, for how she's acting toward her. Zhink is all hisses and growls. The other cats are perplexed but much more accepting. Gert, the big bruiser that she is, is treating little Zhinka's hisses like the buzz from a passing fly. Annoying, but nothing to worry about. Max has been receiving postcards from the Teeny Tiny Swap #2. He's been vigilant in checking the mail, so he can see if he got any postcards today. Each postcard is a little treasure, giving us a glimpse into life somewhere else: from a different part of our own state, to half a world away. We've received postcards from Mama Revival, Rural Mama, Pasha Plum, Geiodo, Julie K in Taiwan, and Cordelia & Samuel (blogless, sadly). Thank you to everyone who has sent us a postcard! They've been a great source of entertainment and education at our house! Coming up (sometime): I'll be posting a list of participants in TTS2, with links to blogs. I had this idea for a pieced, quilted motif to incorporate into something like a bag or a small quilt. I figured I could do it either with paper piecing (which I had never done before) or by creating templates. I tried the paper piecing, which worked, but decided that I liked templates better. 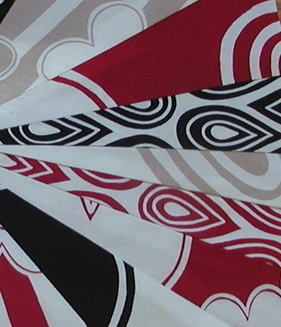 Better control over fussy placement of designs on the fabric. So here's where I am so far, it's actually fully pieced but this is just a part. I have a "thing" (problem? insecurity?) about posting WIP photos, like it will jinx the project or something, so this is just a mostly unidentifiable portion. It's very bright and busy, no? I love the fabrics (Follow Your Imagination neutrals by Free Spirit), but this combo of them isn't quite right, I think. That plus I'm having a really difficult time finding a suitable background for this. I was going to use one of the prints from the set, but that's busy beyond belief. And so far my forays to two fabric stores have resulted in uninspired possibilities. So I'm thinking of redoing this piece, to tone it down a bit. I was so excited about this piece, but the reality of sewing it isn't matching up to the excitement of planning it. Does that happen to you too? For me, it's pretty common. Sometimes it's the other way around, I get more excited once I start working on a project. But that's usually with someone else's pattern. When it's something I make up all by myself, sometimes I hit a place in the middle where I'm very discouraged about the project. I'm hoping to power on through with this one, because I really was very excited during planning, and I'd like to get back to that with a finished piece that I'm happy with. I think this disjoint between idea and reality is a matter of experience. I've done a lot of sewing from patterns, but I haven't been producing my own patterns for that long so sometimes it takes a bit of doing to translate my idea into an actual item. And that's when it gets frustrating. It gives me a new appreciation for all the wonderful designs and patterns people have come up with. If you see just the finished product (or any product after that craftsperson has lots of experience), then it seems so easy. In this case, I don't think it's the pattern (yet), but the colors that are getting me. I have a thing with colors, they don't "speak" to me and so I can spend hours testing various color combos before I find one I'm marginally happy with. We'll see how this goes. Today was a fun day, oh yes it was. It started with a visit from the plumber to unclog our sink. Now this may make that first sentence sound like sarcasm, but in fact I was being truthful. Our sink was just slow, not totally clogged, and so still marginally usable. We really like our plumber(s), they're nice people who do a good job. And Max was fascinated by the whole process, watching everything Mark did at every step of the way. So how could we top a visit by the plumber? Well, with a visit from the postman! As the plumber was leaving, our postman came to the door with a box! A box a box a box!! There was happiness and elation all through the house. Note that at this point, Max didn't know the box was for him, he's just happy about any boxes. It turned out to be for Max, from his miniswap partners Jane and Kate of house on hill road relation. Oh, what a box of lovely goodies! They absolutely made our day, and topping the plumber was difficult to do! 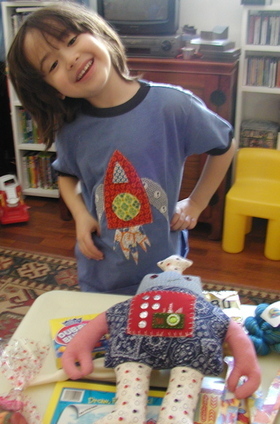 This spaceship-appliqued T shirt is so wonderful, Max immediately put it on and wants to wear it for the next "2 or 3 or 4 days". And a robot! You may recognize the pattern from Hillary. I didn't realize it was such a big robot! He's perfect! I think Max wants to take him to school tomorrow along with the t-shirt, for a little show-and-tell. Also in the box: gummy bears (our favorite brand! ), gumballs, stickers, art paper, a decoupaged "M", and yummyyummy yarn for Mama. It was so funny to find the M in the box, as we sent Jane and Kate a J and a K in their miniswap package! Wait, there was more! A bag of heart-shaped crayons! And the coolest tic-tac-toe game made from a loop pot holder and bottle caps! We played this game for quite some time after opening the box. Unfortunately it's not in this picture... Oh look, Erin has a much nicer picture of all our stuff over at her flickr site. Wow. Thank you Jane, Kate, and Erin! I like good days! We found this accidental arrangement of cinders on a concrete berm a few weeks ago at Sunset Crater. 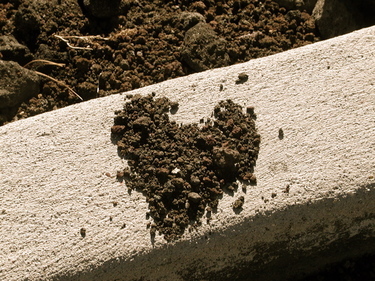 I had walked right by it, Max was trailing behind me and yelled "Mama, a heart!" It's wonderful to be so observant, or at least to be with some who is. I've got short ribs in the slow cooker for dinner tonight, I bailed on the Martha eclairs and just went to the grocery store to buy some for dessert tonight. Max is wallowing in chocolate bliss. We visited Gertie a little while ago, we brought her tuna treats. Gave some to the other cats in quarantine too. Her meow was so pitiful, she doesn't understand why we've abandoned her in this place, but she was happy to see us and there was lots of petting and rubbing through the bars. Even though I know she'll be home in 9 days, I'm pretty morose about this. Thanks for all your sympathetic notes yesterday and today, I'm hopeful the time will pass quickly. This pattern is lovely, from this book (there's a picture of the socks here). However, the likelihood that I would ever wear thigh-high stockings (in public OR in private) is infinitesimally close to zero, so I scaled them down into regular socks. Granted, they're not as striking this way, but I'm hoping they still come out nicely. In the worst case scenario, I'll still have a pair of hand-knit socks. I like the vast expanse of plain-old-stockinette, knit on size 1 toothpicks. Seems I'm not the only one who feels this way about stst. I freely admit that Stephanie's expanses of st are way more vast than mine, but this is all the expanseness my mind can comprehend right now. Which is why I'm not knitting my dh that sweater I promised to knit him ages ago. So above we have 2.5 days worth of progress. I cast on during my sewing group on Monday night. A good amount of time today was spent knitting on the couch, as I believe I'm coming down with something and didn't have the energy to do much else. 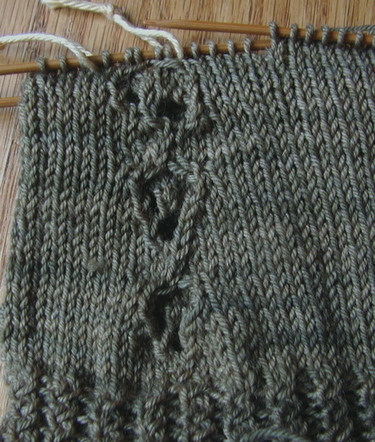 However, we see here a possible problem with knitting while addle-brained. Somehow, on the 3rd eyelet (the one at the top, nearest the needles), I managed to shift half of the eyelet to the left. So it will need to be frogged. But it turns out that's ok, because the socks are huge. I don't know why. I did a gauge swatch, and even washed and dried the darn thing before measuring. I'm good with math. And still there's this, which would fit nicely up and over my knee. Perhaps my addle-brain started earlier than I'm aware of, because this Sunday I was helping a friend get started on knitting a hat for her daughter, and after a few rows we pulled it off to find out that it was about the right size for a skirt. 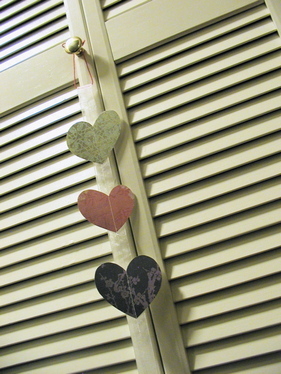 Valentine garlands, modeled on these, via this link from notmartha. 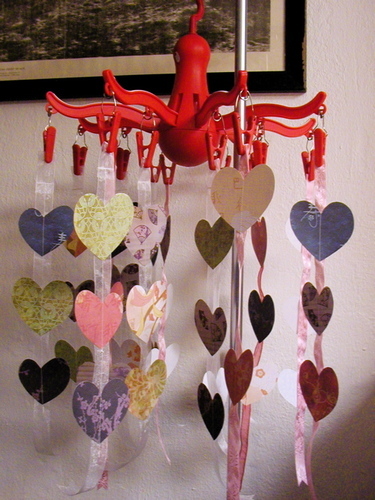 I was in a real non-crafting funk, but seeing these Valentine garlands seemed to have popped me out of it. 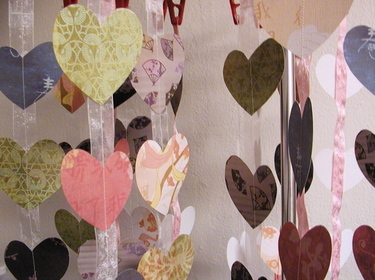 We used patterned coverstock papers, hand-drawn heart templates, and ribbon. We didn't need to use the freezer paper because we just sewed straight down the ribbon (Max sat on my lap and helped place the hearts, well ahead of the presser foot.) Some of the things that I really appreciated about this craft are that it was easy enough for a 5-year-old to help with most parts, we could do little bits each night (cutting the hearts took several days), and when everything was finally cut out, it went together really quickly. I love crafts like this, ones that don't need to go together all at once, ones that we can take our time over, admire the lovely patterns in the papers, put them down and come back to them when we're ready. There are already enough time-critical things without having to do time-critical crafts too. So these will go in our Valentine's cards this year. I'm also considering a new twist on the fabric mache baskets, but given what I just wrote, perhaps I'll rethink that. The glue, getting it all on before it dries, it's more difficult than these garlands. I suppose if we set aside enough time, we can do it. That's always my problem. "Write a 20-page paper, solve the mysteries of the universe, come up with a solution to world hunger? No problem, I can do that this weekend." I must continually remind myself that I cannot do everything I think I can in the short amounts of time I think I can. In the pre-Max era, I would make a more valiant effort to get things done, pulling all-nighters, eating microwave or drive-through meals, cutting every corner possible to eke out more time. No longer possible. This is probably the biggest, best lesson that Max has taught me. Slow down, mama. Sleep, because if you don't you're not very nice to be around. Note to self or anyone else who may try these: don't use wired ribbon, as the wiring causes it to have a mind of its own and twist around. Today's the day for TTS2! Have you sent your TTS2 postcards/pictures/illustrations yet? Yes? Yay! No? Don't worry, I won't tell anyone (especially since ours are going out a day late) but please get them in the mail soon! Above is a little preview of my picture card. 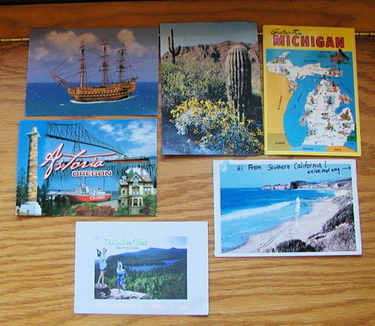 I couldn't get the "Greetings from Kalamazoo" postcards out of my head, so we went with "Greetings" too.